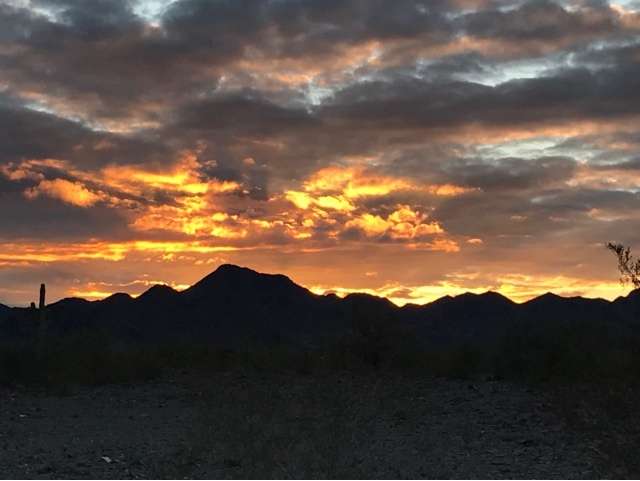 Morning breaks late here as we are in the far end of the mountain time zone (actually Arazona Time as they don't change their clocks ). I moved last night to a least populated area so I could start my Prius for some morning heat without bothering others. It is nice to just get up in a heated car and wash and shave as early as I want. I moved over to the main entrance of the RTR at 8:00 and I was thrilled to see my friend David from San Diego walking down the road ready for a morning walk. Friend D who I usually walk with couldn't make it. After the morning announcements from Bob Wells I went to talk to friend who was selling things in the Garage Sale. She sells hats and hemp jewelry. Her name is Blaze and is a blogger (http://www.rubbertrampartist.com/) and now an author of a book "confessions of a Work Camper". Blaize will be debuting her book this week at the RTR with a reading and book signing. 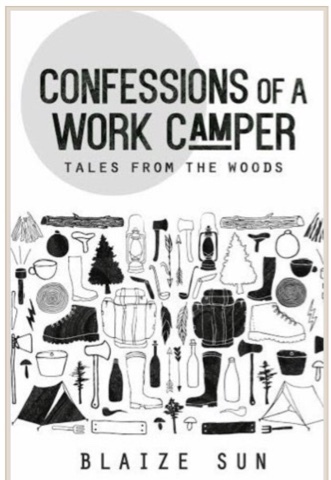 I have bought the book and it is a wonderful collection of her stories as a camp host at the national forest in California during the summer. She writes of her experiences from her blog and many other unpublished stories. Last night I watched a video of a YouTube blogger stating they went looking for a labyrinth near the RTR. He didn't give a location. I found a woman who knew the general location and I set out to find it. It was just off the main road to the RTR but way back from the main gathering area. 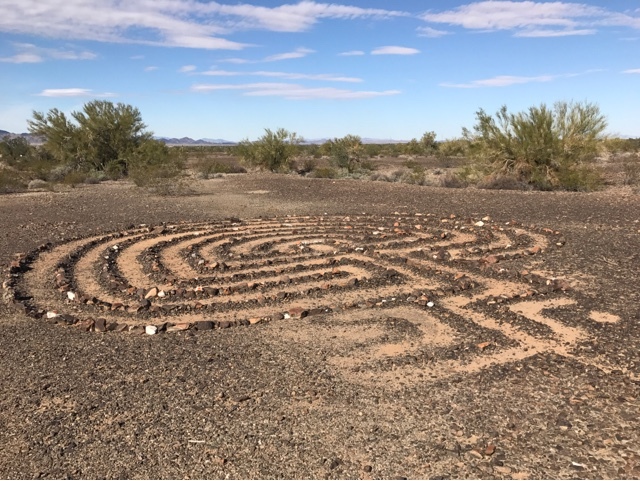 It is nice to find the bit of artwork in the desert. 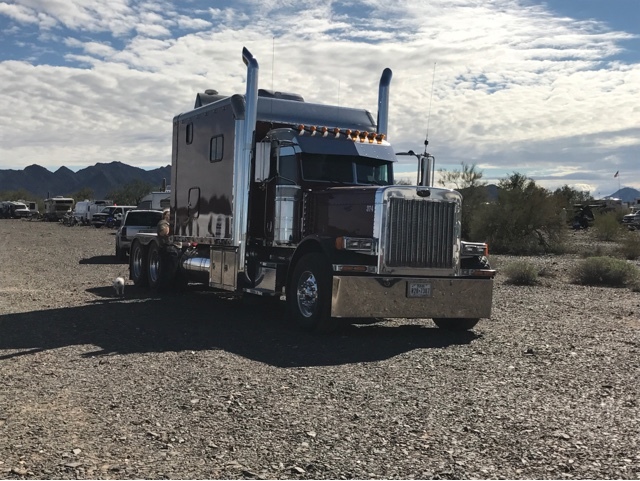 At the RTR are two Tractors that usually haul trailers and this one is very large as it has an extended cab for living in for long haul work. The compartment is large. On the way back from the labyrinth I met Ming with her fiberglass small truck camper on a Toyota Tacoma. She wanted to do what I was thinking of doing last year and get a light weight truck camper. She looked at FWC as did I last year but found them not as light weight as we would like for the Tacima. She has put airbags in her Tacoma as I did and her shell is under 500 lbs. her and a friend are living in it. We shared small vehicle ideas as my Prius designs like LiFePo4 house battery may work well for her. 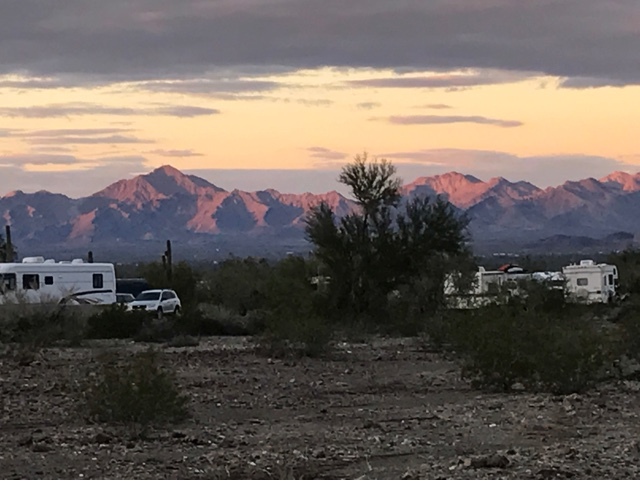 I had previously filled her blog as she has been building her camper. 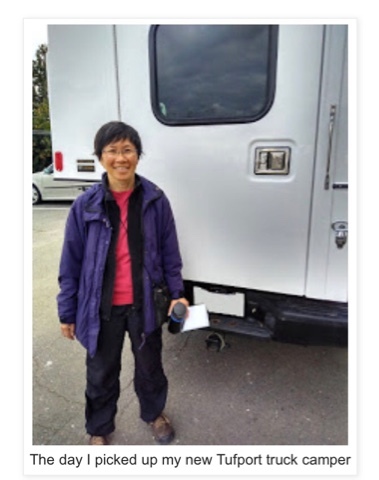 After my visit with Ming I made my way over to a vandweller I have known for 10 months but never met until this RTR. We decided to have dunch (dinner-lunch) with each of us supplying food and each of us cooking what we brought. It was the best meal I have had since being in the road. Salmon, sweet potatoes, summer squash, and salad. I have shared meals with other vandwellers in the past and find it a good way to talk and have a good meal. This one just happened to be in a desert. I moved to my new location away from the RTR gathering area and parked but I had been invited to a gathering near by last night and had passed. 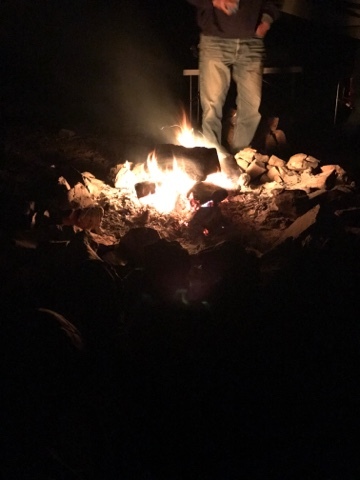 I decided to head over and found the sisters I helped break into their car and we joined a camp fire at a neighboring Class A camper. 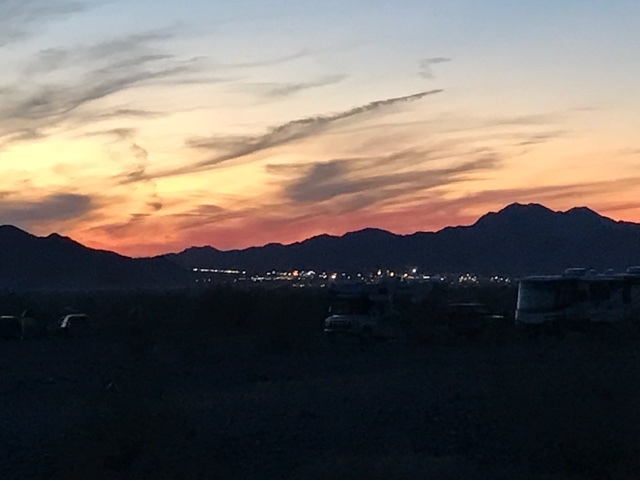 We told stories of travel to other countries around the campfire and eventually it was time to head back to my Prius to blog this post.